Enjoy your holiday on the Costa Blanca: Rent a villa! The beautiful, sunny coastal region Costa Blanca lies in the south east of Spain besides the Mediterranean Sea and has a coast line of 200 kilometres! In the popular seaside resorts Benidorm and Alicante many hotels offer room to the hordes of tourists that come to enjoy the sun, sea and beach. But the Costa Blanca is more than that. Beautiful golden coloured sandy beaches are varied with steep rocks that rise from the sea, an impressive spectacle. The rocks enfold small sheltered bays that make you forget the masses of tourists. You can explore the deep blue, glistening cupolas of churches, just like the crisscross of white houses and mountainous hinterland with almond trees and citrus fruits. The Costa Blanca thanks its name, white coast, to the almond trees. The white pink blossom of the trees colour the entire region white. Rent your villa on the Costa Blanca here! They sometimes say that the summer lasts three months and spring nine months on the Costa Blanca. You can enjoy the sun 300 days per year there. 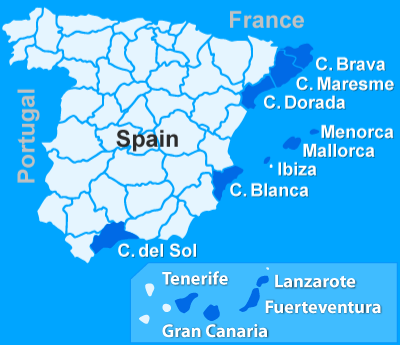 The Costa Blanca has the most sun hours per year in Europe and knows an average temperature of 24 degrees. No wonder that this region is so loved by winter visitors. Around Christmas you can buy freshly picked oranges on the market of Altea and enjoy the view of a sunny Mediterranean Sea in just a T-shirt. When there is ice on the rivers and streams in the rest of Europe, you can smell all the blossom of the almond trees here. At the end of February the first bulbs can be seen and not long after that a true spectacle of white pink blossom emerges. One of the spots to enjoy the beach and the turquoise coloured sea of Denia. Seaside resorts are there in abundance on the Costa Blanca, Benidorm is probably the most known resort. The skyline of this city with all its hotels and apartment complexes is rather impressive, this is the main touristic attraction of the Costa Blanca. Here you celebrate your holiday together, with an almost complete insurance of good weather. You can eat and drink the same things as at home, almost all nationalities are represented with restaurants and cafés. For those who like to go out, it is a Mecca here. There is a multitude of bars and clubs. Of course Benidorm isn’t the only spot where you can carefree enjoy the sun, sea and beach. For example, Alicante, Albir and Altea are also guarantees for a wonderful, relaxed holiday. For those who don’t love mass tourism, there are enough other attractive possibilities. The town Moraira, for example, is a wonderful quiet holiday town against the hills with the beautiful Playa de l’Ampolla. There are small bays that offer a lot of intimacy or a bit bigger beaches for more fun and games. But the character remains peaceful. There is a nice marina and there are nice shops and snug restaurants. The coastal road from Moraira down to the south, to Calp, is one of the nicest routes from the Costa Blanca. You have beautiful views of the Mediterranean Sea, there are many steep rocks and you are surrounded by a pine-tree forest. There are enough restaurants to enjoy the region in a relaxed and continuously varying manner. The mainland is also exceptionally beautiful, especially the part between Altea and Denia. Rugged Mountains flow over the green hills filled with pine-trees, olive trees, almond trees and orange and wine orchards. Here lies the highest point of the Costa Blanca, Sierra Espuna in El Berro, which is 1.579 meter high. Around Elche, east of Alicante, is the only date tree forest of Europe, which is beautiful. Thanks to the mild climate the trees, oleanders, citrus trees and hibiscus grow and blossom all year round, which is a true pleasure to the eye. 19 days of celebration and a lot of bonfire! Fallas (huge pops of Styrofoam/paper mache) will be burned by the fireworks after a parade. Culture lovers can also come to the Costa Blanca to enjoy themselves. The castle Castillo Sante Barbara in Alicante towers out high above the city, a remainder from a glorious past, and you can also find many museums and galleries. You can catch your breath on one of the many terraces on the promenade or in the crisscross of streets where you can find many nice shops. A visit to Valencia, located in the north, only just in the Costa Blanca, is also worth the effort. After Madrid and Barcelona it is the biggest city of Spain. Valencia has a rich history that goes back more than 2000 years that is combined with a buzzing, modern character. Besides the beautiful cathedral and diverse museums, you can do some good shopping or clubbing here. The smaller towns also have a lot to offer. In Guadaest, for example, which is beautifully located, you can find a deep blue reservoir, many small museums and shops where you can find typical handwork products. There are many different remains from the 12th century and you can wander around endlessly in the crisscross of small streets. The Costa Blanca is famous for its Fallas where giant figures of papier mâchéare exhibited, that are burned on the night of the 19th of march. Just as popular are the colourful parades of the Moros y Christianos, which once again remember the old battle between the Muslims and Christians. Also the Semana Santa in the week before Easter is famous for its beautiful processions. If you are in Costa Blanca around this period then you mustn’t miss it! No, this picture ain't upside down. Try it yourself on the Costa Blanca. The Costa Blanca has beautiful walking areas. Many routes have been set out, varying from simple to rather difficult. You can choose the length and the degree of difficulty. The region also offers endless possibilities to golf lovers and of course there is a lot to do on and in the water. What did you think of sailing, water skiing or deep sea diving? Not what you would normally do at home! Adventurers can do cave trips, mountain biking and rafting until their heart is content. It is impossible to summarize everything, there is so much to do on the Costa Blanca. The cities Alicante and Benidorm offer the tourists everything they could want. After the numerous restaurants, cafés and clubs, you can also do some elaborate shopping in all known big warehouses. In the smaller towns you can also shop. In Denia the shops are full with the newest fashion, and also in Javea, Altea and Calpe you can be very successful. Local markets are also very nice where there is an abundant offer of fruit, vegetables, bread, clothing and regional crafts. There are many crafts traditions kept here, like ceramics and basket brushing. Along the entire Costa Blanca you can score many nice products, a nice reminiscent of a wonderful holiday. A holiday on the Costa Blanca? The Costa Blanca is very accessible with one of the many, cheap charter flights on the airports of Alicante, Valencia or Murcia. Are you starting to get excited? You can of course choose to stay in one of the many hotels or apartments. But perhaps you have thought of your own holiday villa? This is not just for other people! You can experience a relaxed, sun filled holiday in and around your own holiday residence. It is fitted with al modern convenience and often has a private swimming pool. So you optimally enjoy your well deserved holiday! Reserve now quickly and safely online and you will soon be in the Spanish sun! Book now your dream villa online. Use the orange button on this page for more information about your dream villa! Sun or shade on the Costa Blanca? Villa in Denia, on the Costa Blanca, Spain with private pool for 12 persons.